The headquarters of A.C.I are right here in PERTH W.A with Contra-Mestre Leo Santos - 'Gringo' at the helm. The Ancestrais Capoeira way is simple & honest promoting the importance of healthy mind-healthy body, to maintain our professional & ethical identity, to work with integrity & fairness. Our goal is to encourage students who show initiative and dedication in these areas. Mestre Senna - Sao Goncalo, Rio de Janeiro Brasil. Capoeira, meaning “wild grass cut short” in the Tupi-guarani language of the Brazilian Native Indian. Capoeira is an Afro-Brazilian slave ritual that has been developing in Brazil since the 1500’s when African people were first brought to Brazil and forced into slavery. 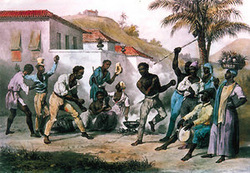 As slaves they were unable to train their traditional fighting style and were suffering under the oppressive rule of the 'Slave Lords" in their daily lives; so the Africans developed and used Capoeira as their outlet. Within the roda of Capoeira they could tone their bodies, train their fighting skills and liberate their spirits through song and dance. Capoeira developed in the cultural melting pot that is Brazil. Africans, Portugues, native Indians and other cultures combined to create the unique ritual of Capoeira. Dance, Fighting, Theatre, Music. The quilombos were the outlawed villages of escaped slaves, they were hidden within the jungles of Brazil. It was in these villages that Capoeira started to incorporate more deadly moves and weapons, the cutthroat razor (navalha) and the machete (facao). Malicia (cunning) was a large part of the game with players trying to trick each other into giving away an advantage. Eventually slavery was abolished and it was after this that Capoeira was known as the dance of liberation because the slaves used it to stay strong and survive, to become free. Capoeira was illegal in Brazil until the 1930’s and had, and to some extent still carries, a bad reputation. Black people were, and still are, the most financially and socially disadvantaged demographic group. They were the poorer elements of society who made up the greater part of capoeiristas (practitioners of Capoeira). It was said that all people who played Capoeira were criminals and con men. To protect their identities, and evade the authorities, capoeiristas were known to each other only by nicknames or Apelidos. In the early 1900’s, in Salvador, Bahia, a great fighter called Emmanuel dos Reis Machado, or Mestre Bimba, was well known and highly respected. In the 1930's he continued to develop Capoeira and incorporated certain elements from different fighting techniques, he added kicks and moves and developed a series of training sequences, transforming Capoeira into a more overt fight, less of a dance, and removing certain traditional aspects of the art, which were not effective in a fight. He also added more expression to his movements and called this style Luta Regional Baiana. Mestre Bimba challenged all comers to fight him and test his method. Such was his fame and reputation that both he and Capoeira were finally recognized by the Brazilian government and Capoeira was legalized. Capoeira that descends from Mestre Bimba is now known as Capoeira Regional. Traditional Capoeira with its old customs and malandragem (cunning) is now known as Capoeira Angola.One of the great names within Capoeira de Angola is Mestre Pastinha who was of the same epoch as Mestre Bimba. Mestre Joao Pequeno and Mestre Joao Grande were his most senior students. With the evolution of this art form since the end of the 1980's we now see Contemporanea - modern day Capoeira.